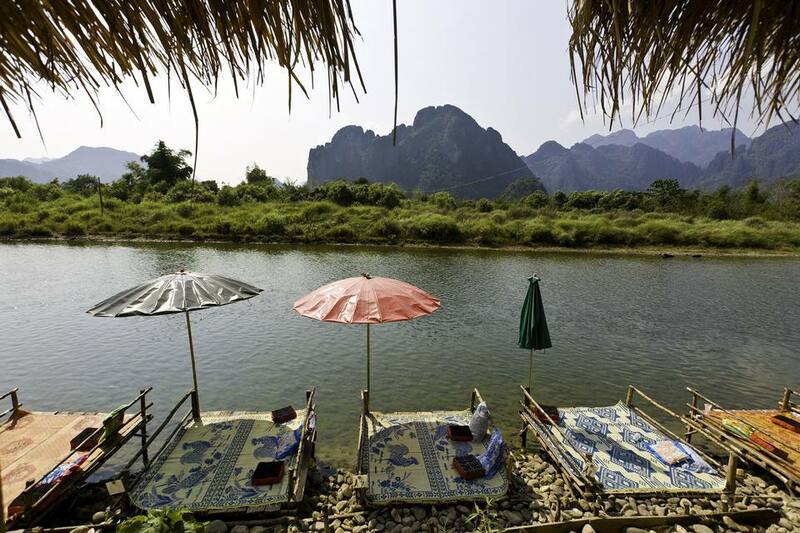 Vang Vieng tubing used to draw thousands of travelers a year to central Laos. After mounting casualties (drugs, drinking and minimal safety precautions in or around a fast-flowing river will do that), the government cracked down on the horde of backpackers partying in Vang Vieng. It was bound to happen. Vang Vieng's landscape is quite simply gorgeous: a scenic river framed by mountains and (on good days) a clear blue sky, surrounded by a landscape with plenty of lagoons and caves to play in. Just add bars, intoxicants, cheap hostels and restaurants pumping out repeats of “Friends” on TV, and you had yourself a perfect place for backpackers to get lost in. New government-enforced rules have cleaned up Vang Vieng, eliminating its more obvious death traps. Tubing was first banned, then gradually reintroduced. The police cleaned out the drugs scene and alcohol sales were curbed. The hordes of drunk, drugged-up backpackers are gone, replaced by a more sedate mixed crowd of Western backpackers and Asian tourists exploring the town and the nearby natural wonders. Even in the offseason, you'll find about a hundred tourists rotating between the bars. Surprisingly, Vang Vieng is bouncing back despite the new limitations. Vang Vieng's tourism officer claims that over 140,000 tourists visited in 2014, a short time after the new rules were set in place. Today, a single tubing center in Vang Vieng's downtown takes care of the reduced number of tourists who go tubing down the Nam Song River. In peak season, about 150 tubes a day take to the river, about a third down from the peak in 2012. During peak season between December and May, the ride can take about four hours to complete, given the river's relatively low levels due to the lack of rain. The trip can go faster in the monsoon season between May and November, as regular rains feed the river and strengthen the current. That's not counting the pit stops usually made at each of the riverside bars; before the crackdown, the sheer number of bars along the river meant that tubers were often completely wasted by the time they finished their ride! There's less chance of that happening today, with only four riverside bars open at any day as per the new law. You can choose to rent dry bags for about US $2 a day to protect your camera and belongings, though they aren't always as watertight as advertised. It's best to bring your own. The price of a rental includes your transportation about 3 km up the river to the starting point from where you will drift down and then return your tube at the rental office. The office opens at 8 am; try to be on the river no later than 11 am to enjoy your day of tubing without being in a hurry. The sun drops behind the mountains around 3 pm and the air cools down considerably. The river water is shallow near the finish point; local kids will come out to help drag your tube in. Although they are smiling and good-natured, helping you get home isn't done out of goodwill - a tip is expected. When stopping at the bars, keep an eye on your tube which will get stacked with all the others at the entrance. Some backpackers have been known to walk to the bars then grab a free tube back to town, robbing you of your deposit and way to get home! The water may feel nice and cool but the Southeast Asian sun is still strong; wear sunscreen. Food in Vang Vieng is much cheaper and better than that found around the river. Check the clock in the rental office, many times they are set 15 minutes fast in an effort to make more people "late".